Epiroc has completed a landmark sale of the first BenchREMOTE in South Africa to key customer, Elf Drilling. CEO Faghmi Cader and founder Eduard Mostert of Elf Drilling explain how this purchase is taking their company into the age of automated drilling. The latest release of the Studio 5000 integrated development environment from Rockwell Automation includes new digital design capabilities to reduce machine design, testing and commissioning times. It also introduces CIP Security support to bring industry-proven security technologies into the automation space. Designed with small and medium enterprises (SMEs) in mind, the new mid-market simulation solution from Altair, SimLab sT, is set to significantly accelerate time-to-market for new products and accelerate product development. 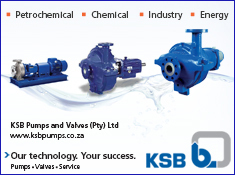 The key factor with compressed nitrogen is that it is inert, absolutely clean and devoid of moisture and contaminants. The colourless, odourless and tasteless compressed nitrogen is set to bring about a major advance in the professional spray-painting industry. From the early days of Industry 4.0, Festo has been deeply engaged and has built up significant experience in research, production and process optimisation. Now an impressive automation platform enables the company’s customers to do the same. Eberhard Klotz, head of Industry 4.0 at Festo, explains. MechChem Africa talks to Richard Lundgren, BI Product Manager about the DYKEM tamper-proof vibration-warning indicator paste and how it can be simply applied to improve safety, reduce inspection time and reduce failure risks across a number of applications and industries. MechChem Africa profiles Qasim Fakir AMIChemE, an active SAIChE IChemE member in the Gauteng Branch, whose rich and varied career highlights the vital role chemical engineering plays in enhancing local manufacturing and product quality. Russell Hattingh, engineering manager for Johnson Controls Systems & Service in South Africa, talks about Central Plant Optimisation (CPO) software, which, he argues, offers better energy savings than any building management system (BMS) alone. Peter Middleton argues that, unlike the Brexit debacle in the UK and the impending election in South Africa, investing in alternative energy options does represent a way of taking back control of our daily lives. Petra Diamonds has installed a modern, fit-for-purpose diamond processing plant at its Cullinan Diamond Mine (CDM), which incorporates thyssenkrupp autogeneous grinding (AG) mills and HPGRs (high-pressure grinding rolls) in the processing circuit. The safe, reliable operation of tunnel boring equipment relies on the integrity of critical bearings and seals. This article from SKF describes the design considerations involved in arriving at suitable solutions. Pharmaceutical and cosmetics plants are often hesitant to replace existing sensors with different measurement devices because the effort and expense of new approvals are frequently much greater than the costs of the sensors themselves. This example from a manufacturer of special chemical substances shows that there are other ways. 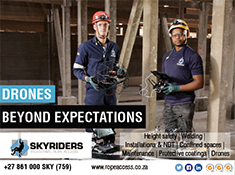 Industrial rope access company, Skyriders, has brought cost and time saving solutions to the company and its clients by introducing collision resistant drone technology to access areas that may pose health, safety and environmental risks on large industrial projects. Mike Zinn talks to MechChem Africa. When replacing underground reservoirs at petrol stations, it is necessary to remove the soil around the reservoir to protect it from gasoline and diesel fuel contamination. Croatian company CorteCros, which is part of Cortec Corporation Group, provides environmentally safe bioremediation solutions for such projects with Bionetix products. Just ahead of Africa Gas Forum, 2019, Total announced the discovery of gas condensate at Brulpadda, 175 km off the Mossel Bay coast of South Africa. This Gas Forum Africa preview unpacks the importance of this find and the potential of natural gas as a cleaner hydrocarbon fuel for its Power Stations. Using Zest WEG Group products such as the IE3 Top Premium Efficiency electric motor and variable speed drive combination for driving equipment such as pumping systems in the agri sector can reduce owning and operating costs while providing much more reliable performance.